mold. After emerging from the mold the cigars are wrapped in what is called a binder. Usually, another type of tobacco. Finally the cigars are wrapped. Thus premium hand rolled cigars consist of three major components. The filler, the binder and the wrapper. When a customer asks you where a cigar is from they are expecting you to tell them where the filler is from as this is the majority of the tobacco in a cigar. Long leaf tobacco requires a tropical climate to grow. Thus the majority of the filler found in our cigars come from the following countries; Dominican Republic, Honduras, Nicaragua, Mexico, Brazil, Jamaica, and Cuba. It should be noted that it is illegal to sell Cuban cigars in this country. 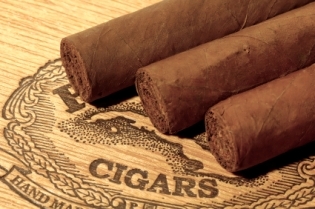 Like wines from different countries, tobaccos tend to have particular characteristics. Dominican cigars are noted for their spiciness- think Pinot Noir. Honduran cigars are some to the most mellow available  like a Beaujolais. Nicaraguan cigars are fuller bodied  like Burgundy. Mexican and Brazilian cigars are rather raw  think of a big non vintage red table wine. Cuban cigars, although hard to come by are very coveted by most cigar aficionados. Many would compare a fine Cuban to the best Bordeauxs available.